I blame my general biscuit obsession on the heavenly biscuits we dined on at the Loveless down in Nashville. That trip was something like four years ago and I’m still trying to find a biscuit that comes close to the perfection that they serve up. Light and airy, they practically melt in your mouth. When I saw that both Cook Wise and the Bread Bible had a recipe for Touch of Grace Biscuits, I hoped that at last my prayers had been answered. I thought that with a name like that, the Universe was trying to tell me that my search had ended. All I can say is that the Universe has not tasted the biscuits down at the Loveless. Because as lovely as these Touch of Grace biscuits are, they did not inspire a religious experience at my dining table. In usual BAH fashion, there were some bumps along the way….and that’s really why you come here, isn’t it? To see how far off course I can go and still right the ship? My adventures are just full of teachable moments, and that’s ok. Anyway, about the biscuits. The first batch was a complete fail. That stash of White Lily flour I have is either A) old; B) not self rising, as I assumed it to be; C) both. Because that batch did not rise one bit. The tops were nicely browned and the bottoms had a lovely crust. But everything in between was a loss. Learning from that teachable moment, I utilized the alternate list of ingredients that uses all purpose flour, cake flour, and baking powder to mimic a self rising flour. And we got lift. That pan of biscuits lasted a day or two, tops. So with one win and one loss under my belt, I decided a tie breaker was in order. For the third batch, I used the White Lily that I had since it was the preferred flour for the recipe, but added the baking powder for lift. And while that batch was technically a success, I didn’t like them as much. Maybe my heavy cream/buttermilk ratio was off. Maybe I should have added in some cake flour to the White Lily. But instead of being touched by grace, they were a little clumsy. Like I said, my kitchen produces many teachable moments. There are a couple other biscuits recipes in the Bread Bible. I think it’s time to study up on them. BAH Note: I’m presenting the all purpose flour version of this recipe. RLB specifically highlights using bleached all purpose flour for the biscuits but she doesn’t say why in the recipe. I’m pretty sure that my flour was unbleached but who the heck knows. Place an oven rack in the middle position. Place a baking stone or sheet pan on the middle rack and heat the oven to 475 degrees for 30 minutes. Whisk together the first five ingredients (1 1/2 cups flour through sugar) in the work bowl of a stand mixer fitted with a paddle attachment. Add the cold shortening and mix on low until all the shortening is worked into the flour in pea sized pieces. With the mixer still on low, add the liquid and mix until the dough is just combined. The dough will be very soft and wet. Let it sit in the bowl for 2 to 3 minutes. Meanwhile, spray an 8 or 9 inch cake pan with nonstick cooking spray and set aside. Place the remaining 1 cup of flour in a pie plate, cake pan, or dinner plate. Using an ice cream scoop, or your hands, scoop up a portion of dough and drop it into the flour. Sprinkle it lightly with flour and sprinkle a bit of flour into your hands. Pick up the dough, gently shape it into a round, shake off any excess dough, and place the dough into the prepared cake pan. Be sure to fit them together snugly so that the dough will rise instead of spread. Once all the biscuits are in the pan, brush the tops with the melted butter. 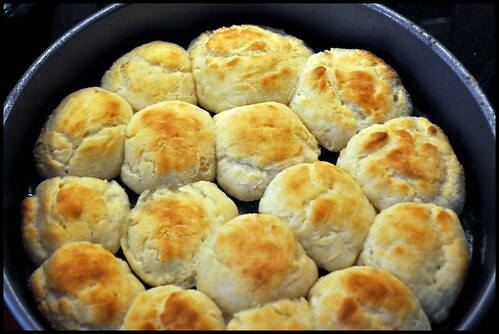 Put the pan of biscuits in the oven on the baking stone or sheet pan. Increase the oven to 500 degrees for 5 minutes then lower it back to 475 and continue to bake for another 10 to 15 minutes until the biscuits are lightly brown and have doubled in size. Cool the biscuits in the pan for a few minutes then empty them onto a plate. Separate the biscuits and enjoy them plain or topped with butter or jam. I bet those amazing biscuits you had contained a crazy secret ingredient–most likely fresh lard. My grandmother used to make AMAZING biscuits and the secret was her relationship with the butcher, who would give her lard. I don’t have the stomach to cook with the stuff, so my butter biscuits will hae to do. Beth, there was magic in those Loveless biscuits for sure. Be it lard or pixie dust, there is something special about them. These were the biscuits that fueled us through the Big Dig of 2010. Hopefully it won’t take another three feet of snow for me to make them again. I too am obsessed with biscuits and these look amazingly crumbly and moist. I think I used regular flour the last time I made my batch too and they weren’t as fluffy as I would’ve liked but they were really delicious nonetheless. Christine, the airy, fluffy biscuit is my elusive goal. That said, I will never say no to a good biscuit…even when I really ought to. Wow, I haven’t had a biscuit in so long! To be honest, I don’t know if I’ve ever had a biscuit that wasn’t from McDonald’s, Red Lobster, or a box mix, so I always thought they were made with all butter. Maybe lard is the secret. I went on the Loveless site, and they sell biscuit mix. Maybe their recipe is on the bag? (Though you’d think they wouldn’t want to give away their secret, right?) But I think yours look delicious already! Thanks Jen. It never occurred to me that Loveless would sell a mix. I see some online buying in my future, even if it probably isn’t their super secret recipe that you get at the restaurant! Breads, in their many forms, vex me. I take my victories, and my biscuits, when I can get them. So Jen’s mention of biscuit mix on the Loveless site got me to clicking. We’re getting some Loveless goodies shipped. I see a Loveless dinner on the menu in the near future. It will be a veggie free zone! And sadly, I read that Carol Fay, the Biscuit Lady extraordinaire, recently passed away. I will certainly give quiet thanks to her as we dine on our home version of Loveless biscuits. You could try taking out the shortening and butter and all that cream and instead using a 6oz cup of cream and an 8oz cup of milk(full fat). If you need more or less liquid then adjust keeping the same ratio. The mix should be quite wet and tacky and require flouring your hands and implements when patting out and putting on tray. You might also find that the faster you make your biscuits– that is, from the first mix to putting them in the oven–will make them fluffier(should be within 15mins which is doable). The other thing that can help is to mix with a normal table knife with a reasonably long blade, but not sharp and no pointed end. I have never used a mixer for making biscuits. Too much mixing can be an issue. Fiona, you make a great point about needing to work quickly once all the ingredients are mixed together. This is not the kind of recipe you want to wander off from. As much as I wish I were gifted to the point of not having to use the mixer to get my fats incorporated into the dry ingredients, that’s the only way that works for me. And you are absolutely spot on about the fact that this dough is supposed to be very wet and anything that touches it – hands, scoops, spoons, will need to be floured. Elizabeth, those biscuits didn’t stand a chance of survival in our house. You really should try the buttermilk shortbread biscuits in the Bread Bible…I think they are what you are looking for…but it does depend on everything when you are making them. Especially how fresh the ingredients are and how thick you make the biscuits…I chose 1 1/2 inches before baking…amazing! And just Unsalted butter for baking. Buttermilk shortbread biscuits? How could I have possibly missed those???? I am happy to say that I gave the Touch of Grace biscuits another go and finally got the hang of them.